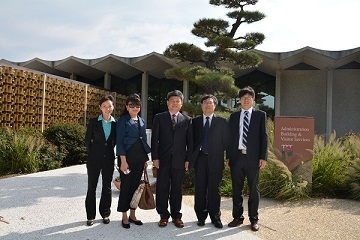 International Centre for Bamboo and Rattan >> Chinese Delegation of China Garden Project Joined the Ninth Sino-US Joint Working Group Meeting in U.S.
Chinese Delegation of China Garden Project Joined the Ninth Sino-US Joint Working Group Meeting in U.S. Invited by United States Department of Agriculture (USDA) and American National China Garden Foundation (NCGF), Dr. Fei Benhua, Executive Deputy Director General (DG) of the International Center for Bamboo for Rattan (ICBR), the State Forestry Administration (SFA), DG of the China Construction Leading Group Office, Sino-US China Garden Project (CGP) led a delegation of five members to attend the Ninth Sino-US Joint Working Group Meeting of CGP, joint design sessions and fundraising Moon Festival Celebration in U.S. during 9-13 September 2014. September 10 saw Moon Festival Celebration in the U.S. National Arboretum (USNA) in Washington, U.S., which was joined by a total of over 100 attendees covering Secretary Tom Vilsack of Agriculture, Minister Counsellor Li Chaochen and Counselor Mei Jianping from the Chinese Embassy in U.S. and delegates from Chinese Delegation of CGP, NCGF, potential donors, etc. 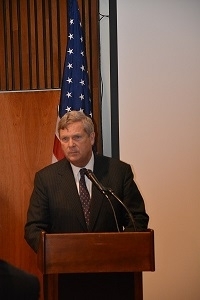 Secretary Vilsack delivered opening remarks; Director Richard Olsen gave remarks on behalf of USNA. Chinese delegation exchanged extensively with attendees of the Celebration, and shared insights on the advance of the CGP. Moon Festival Celebration made a great difference in promoting the Foundation’s fundraising. Joint Design Sessions of the CGP was launched in the morning of September 11 in USNA. A total of 17 participants including members of Chinese delegation, NCGF, Page Southerland Page joined in the sessions during which issues of water source, landscape and security were discussed. It was agreed that both sides establish a regular communication mechanism via video, e-mail and telephone conference, etc. to strengthen exchanges through timely discussion to complete the design as soon as possible. The Ninth Sino-US Joint Working Group Meeting of CGP was held in the afternoon of September 11 in USNA. President Bob Stallman of NCGF chaired the meeting, joined by Under Secretary Catherine Woteki of USDA, Chinese delegation, members of NCGF and Page Southerland Page. The China Garden Project has been included for consecutively five times in the outcome lists of the U.S.-China Strategic and Economic Dialogue. Opening remarks were delivered by Under Secretary Woteki and President Stallman on behalf of the U.S. side, and Dr. Fei Benhua on behalf of the Chinese side who all spoke highly of sincere cooperation and hard work between the two countries. Dr. Holly Peng, Expert of Chinese Design Team of CGP, gave a presentation of the China Garden progress report on the Chinese side, which was followed by a presentation of NCGF’s recent progress by President Bob Stallman. After the meeting, the two sides negotiated further on the details of Yingcheng donated funds and reached consensus. 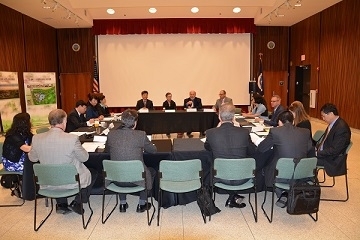 In a short span of two days, the Chinese delegation joined in the Ninth Sino-US Joint Working Group Meeting of CGP, discussed joint design of the Project, attended the Moon Festival Celebration, negotiated details of implementing agreement on Yingcheng donated funds and talked with New York Branch, Bank of China, which achieved expected results.